This nutmeg grater (Fig A) is attributed to the Philadelphia maker, JOSEPH RICHARDSON, JR and comes from The Collection of Roy And Ruth Nutt; Highly Important American Silver auctioned by Sotheby's NYC, early in 2015. The silver nutmeg grater's form is generally described as a canted cornered rectangular box nutmeg grater with double lids. It is typical in design with many other well documented British and international examples. Contained inside is a rectangular mark with rounded corners; its maker's mark is styled using Roman font capital letters. A photograph of this maker's mark remains unavailable for display on NutmegGraters.Com. In hopes to authenticate (or refute) its attribution to Joseph Richardson Jr., this antique researcher used (on site) a method of visual comparison, where this mark was contrasted against authenticated J. Richardson Jr. maker's marks. As a world class collection of utmost quality in American silver, the Nutt Collection auction was widely publicized throughout the antique press. This nutmeg grater appeared in Sotheby's printed catalog as well as their on-line catalog. Prior to the Sotheby's NYC auction on January 24, 2015, this canted cornered rectangular box nutmeg grater with double lids was on preview display to the public. The catalog described "Lot 508 ~ AN AMERICAN SILVER NUTMEG GRATER, JOSEPH RICHARDSON, JR., CIRCA 1795 ~ rectangular with cut corners. 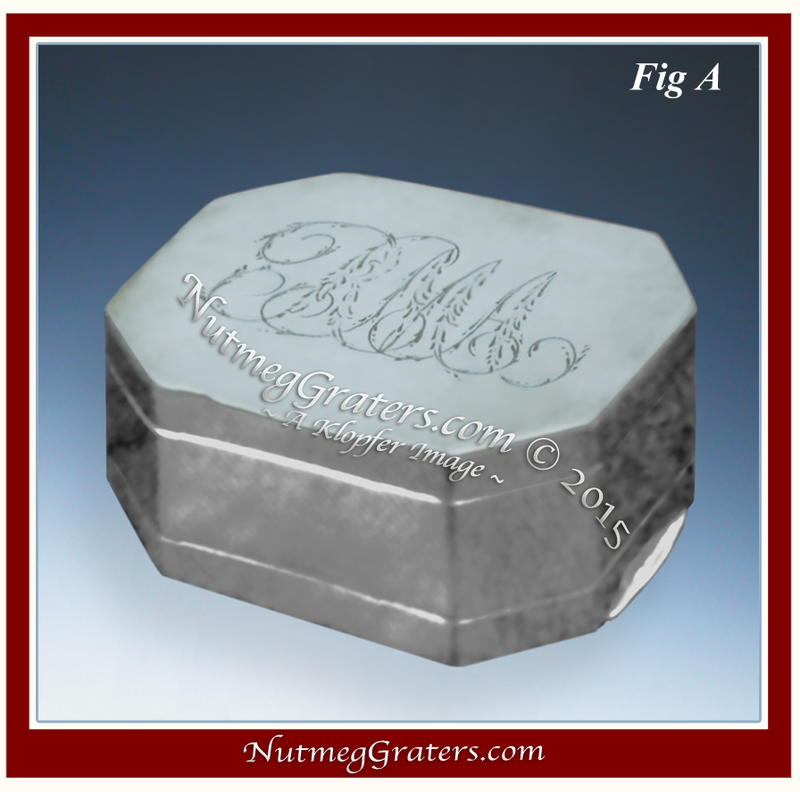 Marked JR in a rectangle: engraved RMA in script on underside of lid: on top of lid. ~ PROVENANCE: Jackson/Gillooly, January 1984 ~ $2,000-$3,000." This nutmeg grater was examined to corroborate its maker's mark by direct comparison in contrast to known and confirmed maker's marks. Although the mark in question was similarly styled using Roman font capital lettering in the manner of the Richardson impressions, specific characteristics of each serif terminal and its letter proportionment clearly did not match any of the confirmed Richardson maker's marks. The form of this silver nutmeg grater is generally known as a canted cornered rectangular box nutmeg grater with double lids. The Klopfer Image File is a collection of several thousand detailed photo images of nutmeg graters: [sources include but are not limited to ~ books and auction catalogs, on-line sales or auction archival resources, private and public collections.] Among these files, 92 examples of canted cornered rectangular box nutmeg grater with double lids are documented. The vast majority originate from Great Britain (most are from London or Birmingham; but a small number of Irish and Scottish examples are also documented); all of these bear date marks evenly distributed between 1789 to 1828 ~ with a London example reintroduced in Circa 1840 and another in Circa 1890. About 2 percent of this form nutmeg grater bear only a maker's marks (presumably of British origin, made prior to 1889). Rarer examples from the United States and possibly, China are also documented as being from this period. These nutmeg graters were embellished using bright-cut, machine cut, ribbed-patterning, or engraved designs, yet some were left "plainish" in style. By the 1780's, silversmiths purchased pre-rolled sheet silver from silver refiners, no longer melting their own silver stock. 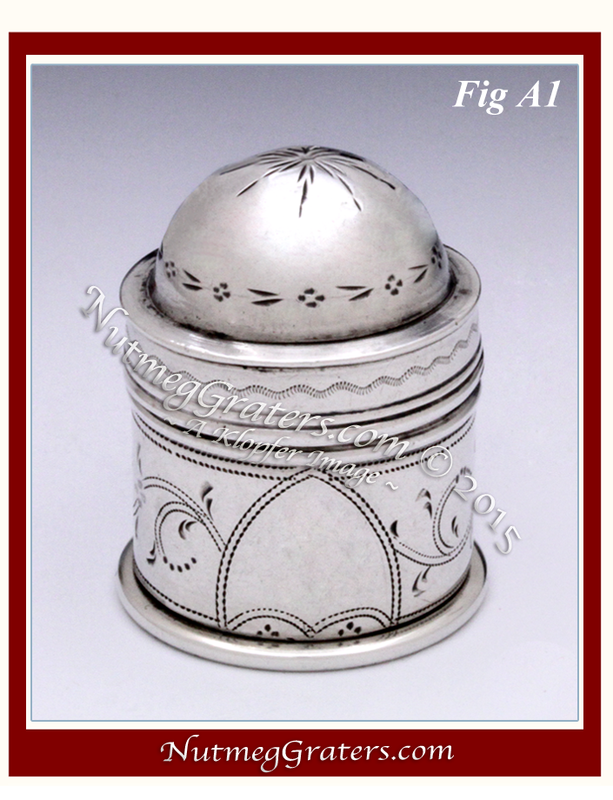 This new technology impacted the construction methods and silversmiths created nutmeg grater forms that were readily made using flattened silver sheets (as can be seen in Fig A). [Goldsborough, 1975]; Silver In Maryland [Goldsborough, 1984]; Manufacturers' Marks on American Coin Silver [McGrew, 2004]. Historically, the letter "J" was the last alphabet symbol to evolve, and that the differently shaped letter symbols "I" and "J" had interchangeably represented a singular letter concept. Some claim that French names, such as "Jacques", developed as a new and distinctive sound, and that later, this sound with its "J" letter symbol was adopted throughout Europe. In 1633, Charles Butler's book, English Grammar, was the first publication to definitively distinguish difference between the two letter symbols ~ "I" and "J". Following this, it required more than one hundred and fifty years before silversmiths in Britain and the American Colonies adapted to the more modern symbol "J". Today, the letter "J" remains one of the least commonly used letters in the English language. It most commonly appears as an initial letter in people's first or last names. From a review of the literature, this study identified five silversmiths utilizing a "J•R" maker's mark [lettering separated by a pellet mark] within a rectangular indent. Only three of these fall within the time period of fabrication for the nutmeg grater in question. (1). Little is reported of John Robertson I of Newcastle, England. His business was located on Dean Street, where he was active from 1795 until death in 1801. His maker's mark "J•R" was registered in Newcastle from 1798 until his death. He was in a brief partnership with David Darling. Items identified as his products are "Coffee pots, flatware, mugs, tongs, & trays". During the time period of Robertson's work, English statutes required, under strictly enforce law, that nutmeg graters bear a full set of English hallmarks. This makes doubtful that the nutmeg grater under study was his product. (2). This study found no information pertaining to John Rigby, a silversmith, from Dublin, Circa 1797. More research is required. (3). Illustrated in (Fig B) is an authenticated "J•R" maker's mark for Joseph Richardson Jr. who was a prominent American silversmith. His work is very well studied and he produced a silver tear-drop form pocket nutmeg grater of which several examples are known.. His earlier examples were made in conjunction with his brother Nathan Richardson and are marked "INR". His later examples, made after the brothers separated their partnership, were marked "J•R". He has other maker's marks without the "pellet", but they are not know on his nutmeg graters. 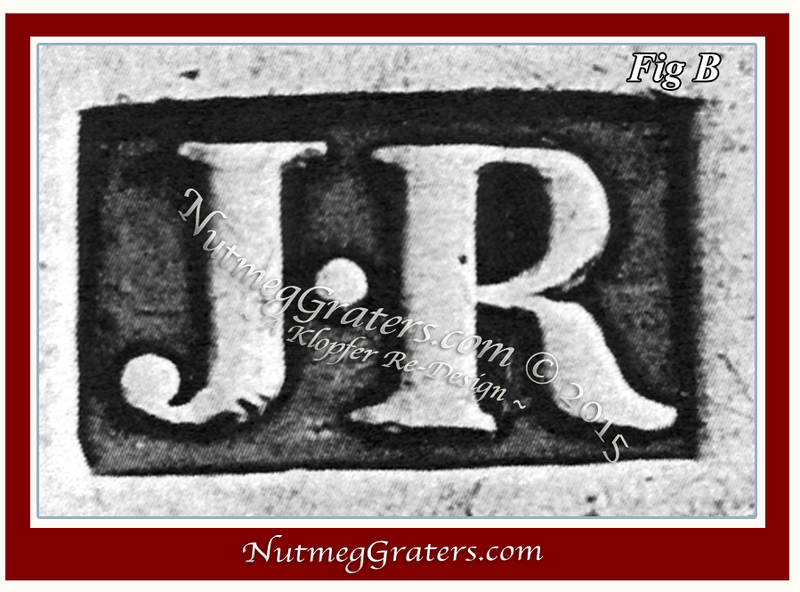 Using Direct Visual Comparison, the mark on the nutmeg grater from the Nutt Collection did not match any authenticated Joseph Richardson, Jr. maker's marks. In absence of a large and high resolution image with the maker's mark in question, no determination regarding its authenticity is concluded here; yet with certainty we conclude that this canted cornered rectangular box nutmeg grater does not bear the Joseph Richardson, Jr. maker's mark. As a result of careful investigation and based on evidence, Sotheby's experts determined that the maker's mark for this nutmeg grater was not that of Joseph Richardson Jr. of Philadelphia. They determined that the nutmeg grater in question was of English origin. Sotheby's removed "Lot 508" from their 2015 sale. please feel free to contact this site. Thanks!